Confession: I wasn’t big on podcasts until I started my own. Or, at least until I started thinking about starting my own. I never disliked them, but I guess I just hadn’t found any that “grabbed” me. But once I started listening to a few—and was a guest on a friend’s show a time or two—the bug bit hard. Now my podcast collection grows by at least one new show a week. When my commute to and from work was longer, I could knock out at least one episode per day. But now that my commute is shorter (which I’m definitely not complaining about), I’m looking for other opportunities to listen. So far, I’ve found that while I’m cooking, cleaning and getting ready for work in the mornings are my next best options! I love podcasts for their entertainment purposes, but they’re also great sources of news and what’s going on in the country and the world. There really is a podcast out there for just about anything. And if there’s not… then you can start one! Just like I did. 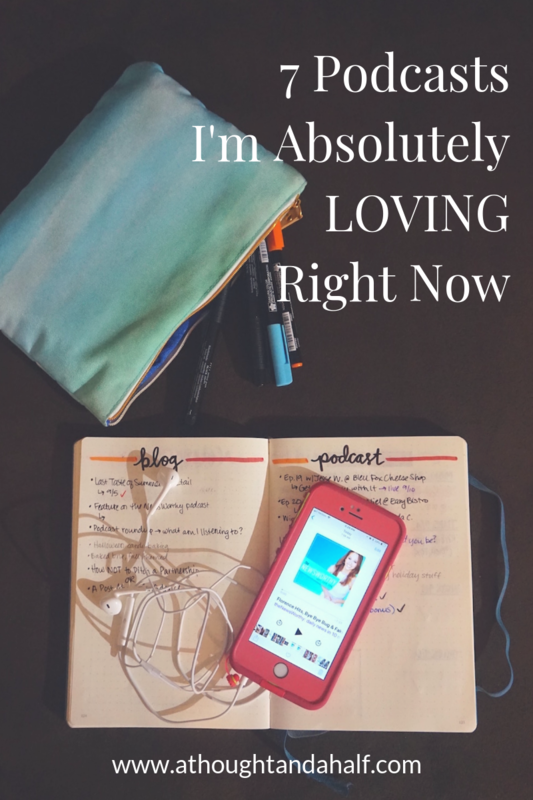 Here are 7 podcasts I’ve been absolutely loving lately! Today I’m sharing some of my favorite podcasts from the last year. I hope y’all check them out and enjoy them as much as I do. An Acquired Taste // This was the first “big” podcast I really got roped into (sorry, Marc Maron). It’s hosted by three ladies who I first “discovered” on a nationally syndicated radio show. I’m so glad they have a podcast because they’re so entertaining, enlightening, inspiring, and each episode really just feels like hanging out with your best gal pals. Southern Spirits // Drinks and ghost stories? Sign me up. Mitch and Leah are incredibly entertaining and I always look forward to what ghastly tales they have to share each week. They also just launched a Tailgate Tales series in honor of football season! Potluck // I just started listening to this recently and I hate myself for not checking it out sooner. Chris and Will from Made South cover everything from food to music, from literature to football. I look forward to their monthly Old Fashioned Friday episodes, and I’ve been loving their recent Instagram Live chats. The Millennial Homemakers // What questions do you have about hosting a party? Decorating for a holiday? Meal-prepping? Starting a capsule wardrobe? Jackie and Jaclyn have the answers! Check out The Millennial Homemakers for all things home, hostessing and more. You can also catch Jaclyn on episode 4 of my podcast! The Startup Show // Started by a former coworker of mine, The Startup Show is the podcast for business owners, entrepreneurs, marketers, or just anyone looking to learn more about the biz life. A few of my favorite episodes include building a legacy that lasts, his conversation with copywriter Ana Gotter, and productivity guru Jocelyn K. Glei. Open Mic Spotlight // If music podcasts are more your speed, add Open Mic Spotlight to your library. It’s hosted by Chattanooga singer-songwriter Heatherly, and she chats with musicians from all over. Each episode is like its own little “open mic.” Heatherly also appeared on my podcast earlier this summer. The NewsWorthy Podcast // I think we can all agree that it’s hard to find dependable, “good” news these days. I spend a lot of time on social media, thanks to my day job, and the news and current events are just, well, depressing. And so much of the “news” I see, I often wonder how “true” it is or how much it’s been slanted toward one side or another. Fortunately I’ve found a podcast that’s fast, fair and fun, and I can listen to it during my short commute to work! Host Erica Mandy worked as a TV journalist in Los Angeles (and several other markets along the way) before leaving her news job to start the NewsWorthy Podcast. She was tired of hearing about how sad, depressing, boring and biased the news was and wanted to make news fun and enjoyable again. Thank goodness for that! There is no other podcast or news source out there like this one. 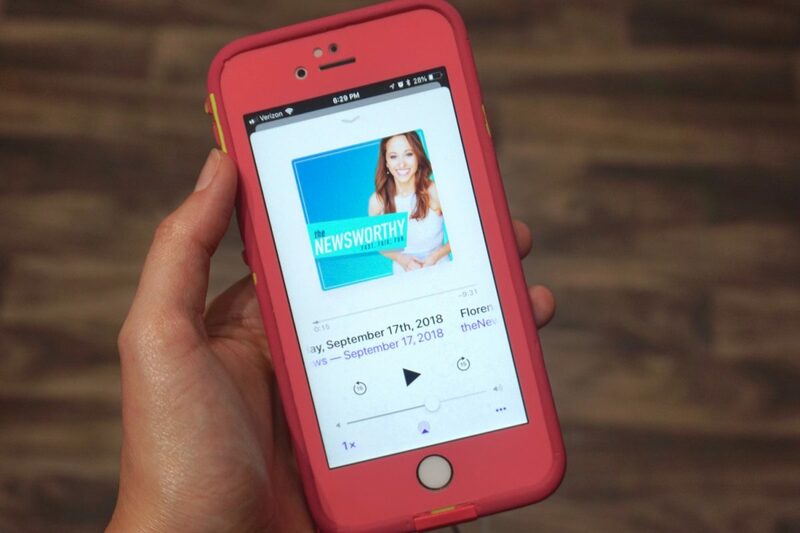 Each episode of the NewsWorthy Podcast covers the day’s top headlines, spanning from politics and sports to awards shows and everything in between. New episodes are available every weekday by 4:00 am Eastern time. Seriously, 4 in the morning. But as a seasoned TV news reporter, she’s no stranger to late nights! Shoutout to Erica from the NewsWorthy for chatting with me via email! Let me know if you’re ever in Tennessee or Georgia any time soon? Are you a podcast fan? What podcasts are you listening to and loving lately?